Technical Analysis of Sterling Aussie (GBP/AUD) Currency Pair. Technical Analysis of Sterling Aussie (GBP/AUD) Currency Pair: In this post, we have highlighted the possible move of Sterling Aussie (GBP/AUD) Currency Pair with the help of our Technical Analysis as shown below. The chart shown here is a weekly time frame chart of the Sterling Aussie (GBP/AUD) Currency Pair. What is the current Price structure of Sterling Aussie (GBP/AUD) Currency Pair? 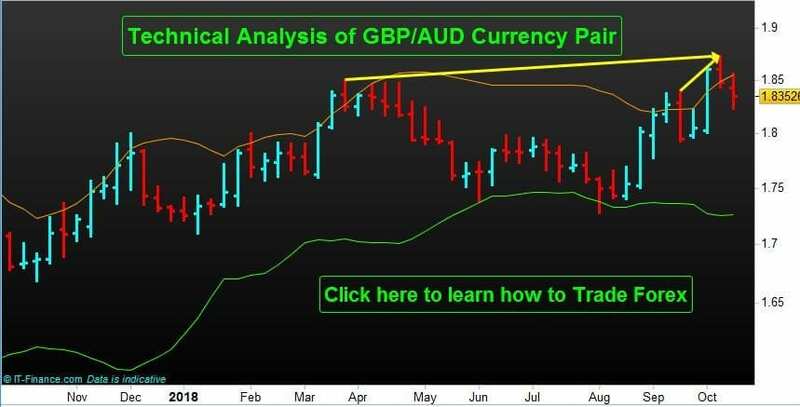 How you can take advantage of Our Technical Analysis for the Sterling Aussie (GBP/AUD) Currency Pair. 1> What is the current Price structure of Sterling Aussie (GBP/AUD) Currency Pair? : Last week (week number 42) price of Sterling Aussie (GBP/AUD) Currency Pair closed at 1.8352 on 15th of October 2018 which is lower than the low of the price bar of week number 41 which was at 1.8434. Week number 41’s bar was an up bar since the high of the week number 41 was higher than that of week number 40 and also the low is higher than that of week number 40. Last week’s (week number 42) bar is a down bar since the high of the week number 42 bar is lower than that of week number 41 and also the low is lower than that of week number 41. This structure combination of the last 3 weeks has created a peak in the high of week number 41 at 1.8736. 2> What are the resistance, support levels for Sterling Aussie (GBP/AUD) Currency Pair we are illustrating here according to our current observation: The current peak as plotted by price on week number 41 at 1.8736 can be considered as the current resistance level. The support levels can be found at the swing low plotted in the week number 38 which was at 1.7936 and then at the swing low plotted in the week number 34 which was at 1.7410. 3> What Price of Sterling Aussie (GBP/AUD) Currency Pair can do in future: At present we have drawn two uptrend lines for Sterling Aussie (GBP/AUD) Currency Pair, one by joining the swing low plotted in the week number 34 which was at 1.7410 and swing low plotted in the week number 38 which was at 1.7936. The second trend line is drawn by joining the swing low plotted in the week number 32 which was at 1.7283 and swing low plotted in the week number 34 which was at 1.7410. Since the price has closed below the first trend line (the pink line in the above chart) for the Sterling Aussie (GBP/AUD) Currency Pair there can an opportunity for the price to come and test the second trend line (the green line in the above chart). 4> How you can take advantage of Our Technical Analysis for the Sterling Aussie (GBP/AUD) Currency Pair Market: As shown by two yellow thick lines Sterling Aussie (GBP/AUD) Currency Pair has plotted a “Double Top” market structure. To technically identify the next possible price objective for Sterling Aussie (GBP/AUD) Currency Pair in the Professional way so that it will be easier for you to Trade Sterling Aussie (GBP/AUD) Currency Pair in future from the current level and to find out the answers to all your Trading related queries, please contact us at 03 9566 7275 and book your FREE discussion session for 30 minutes at Level 3, 2 Brandon Park Drive, Wheelers Hill, Victoria 3150. 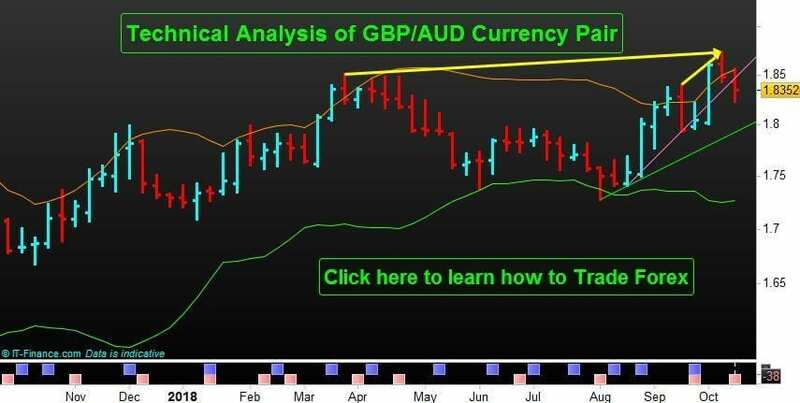 Now you can learn to trade Sterling Aussie (GBP/AUD) Currency Pair with us to explore the possibility of earning passive income keeping your day job. Our Proprietary Forex Trading Strategy which work will guide you through every step of your trading in Sterling Aussie (GBP/AUD) Currency Pair and explore the possibility of earning extra income. Learn what all other Forex Currency Pairs we are Trading in our Forex Trading Asset Class. Develop yourself as a professional trader capable of capturing second income in the future with us.